Baksalary, J. K. (2004). An Elementary Development of The Equation Characterizing Best Linear Unbiased Estimators. Linear Algebra and Applications, 388:3-6. Baksalary, J. K., Mathew, T. (1986). Linear Sufficiency and Completeness in an Incorrectly Specified General Gauss-Markov Model. Sankhyā, 48:169-180. Baksalary, J. K., Mathew, T. (1990). Rank Invariance Criterion and Its Application to The Unified Theory of Least Squares. Linear Algebra and Its Applications, 127:393-401. Harville, D. A. (1997). Matrix Algebra From a Statistician's Perspective. New York: Springer. Haslett, S. J., Puntanen, S. (2010). Effect of Adding Regressors on The Equality of The BLUEs under Two Linear Models Journal of Statistical Planning and Inference, 140:104-110. Hauke J., Markiewicz A., Puntanen S. (2012). Comparing The BLUEs under Two Linear Models. Communications in Statistics: Theory and Methods, 41:2405-2418. Isotalo, J., Puntanen, S., Styan, G. P. H. (2008a). A Useful Matrix Decomposition and Its Statistical Applications in Linear Regression. Communications in Statistics Theory and Methods, 37:1436- 1457. Isotalo, J., Puntanen, S., Styan, G. P. H. (2008b). The BLUE’s Covariance Matrix Revisited: A Review Journal Statistical of Planning Inference, 138:2722-2737. Magnus, J. R., Neudecker, H. (1988). Matrix Differential Calculus with Applications in Statistics and Econometrics. New York: Wiley. Mathew, T., Bhimasankaram, P. (1983). On The Robustness of LRT in Singular Linear Models. Sankhyā, Series. A, 45:301-312. Mitra, S. K., Moore, B. J. (1973). Gauss-Markov Estimation with an Incorrect Dispersion Matrix. Sankhyā, Series A, 35:139-152. Rao, C. R. (1972). A Note on The IPM Method in The Unified Theory of Linear Estimation. Sankhyā, Series A, 34:285-288. Rao, C. R. (1973). Representations of Best Linear Unbiased Estimators in The Gauss-Markov Model With a Singular Dispersion Matrix. Journal of Multivariate Analysis, 3:276-292. Tian, Y. (2009a). On an Additive Decomposition of The BLUE in A Multiple Partitioned Linear Model. Journal of Multivariate Analysis, 100:767-776. Tian, Y. (2009b). On Equalities for BLUEs under Misspecified Gauss-Markov Models. Acta Mathematica Sinica English Series, (25) 11:1907-1920. ISNAD GÜLER, Nesrin . "RELATIONS BETWEEN BLUES IN TWO LINEAR MODELS". 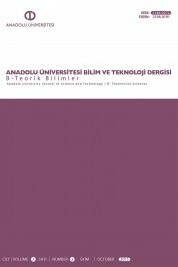 ANADOLU UNIVERSITY JOURNAL OF SCIENCE AND TECHNOLOGY –B Theoretical Sciences 2 / 2 (May 2015): 103-109.